My aunt, from the Bay Area, spends much of her time on Oahu. 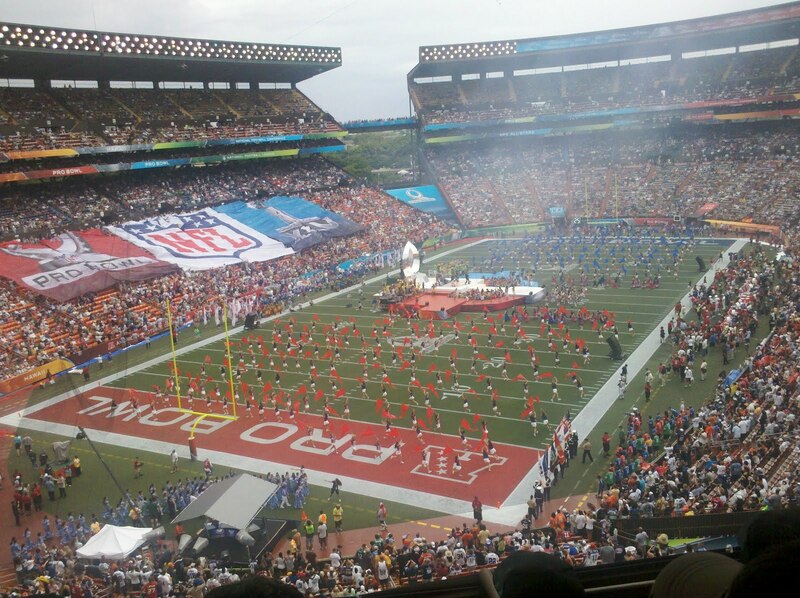 She’d invited us to join her and her friends for the Pro Bowl at Aloha Stadium. I’d been to Aloha Stadium twice before for USC-UH football games. At the game last fall, Mark and I first talked about possibly moving to Hawaii. In San Francisco we aren’t any different from any other couple. The City is so diverse that there are mixed race people and mixed race couples everywhere. Oh, did I mention that Mark is Asian? Well, he is. At the Pro Bowl tailgate, I searched the foods people brought with them. I realized Hawaiians sweeten their meats, yet the desserts aren’t always sweet. (Unless there’s chocolate, it’s not a dessert in my opinion.) I ate Korean chicken yet again, with macaroni salad and rice. When it started to rain, we headed into the stadium to our seats, which were under cover. Once we were sitting in the correct seats, the Asian man behind us said to the back of my head, “You must have beautiful kids. Hapa kids are always beautiful.” He explained “Hapa” is what they call kids of mixed Asian/Caucasian descent. It’s short for “Hapa Haole”. Hapa means half. Huh, I thought being a mixed race couple might be a problem. I didn’t know the not married part was.